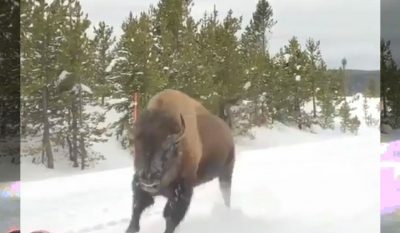 Some ‘lucky’ folks on a winter wildlife tour of Yellowstone National Park experienced a heart-stopping moment after a huge bison zooms past their vehicle – sending a jolt of panic throughout the entire group. The intense encounter took place last month during a tour of Yellowstone National Park, and was captured in a dramatic video you can view below.. The video shows a large American bison – which are known for weighing around 2,000 pounds – barreling past visitors as they travel down a road through the park. Some people have made the mistake of thinking because of their size, bison are slow-moving or even lazy animals. Don’t be like these people. Despite their massive stature, bison are capable of moving at an impressive clip, reaching speeds up to 35 mph..
That’s pretty much a tiny freight train running at you head-on! The post Video: Massive Bison Zooms Past Tour Group in Yellowstone National Park appeared first on OutdoorHub.